NOTE from Webmaster: Be sure to also check out the external CV/MIDI units that can be used with the Odyssey listed under the Accessories page. 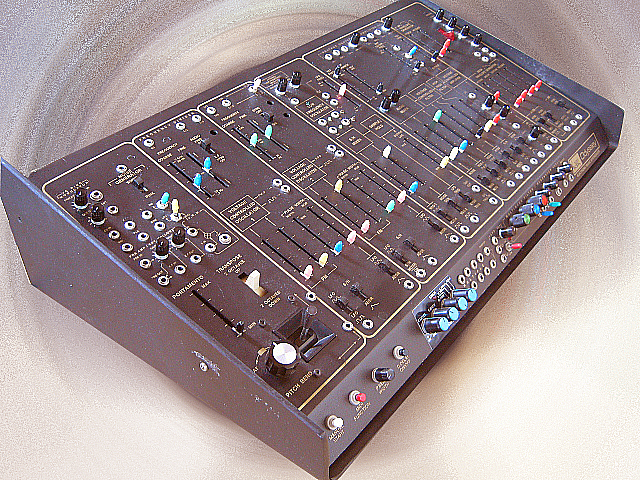 The newer style Odysseys used a zener diode as a noise source rather than a noise transistor. 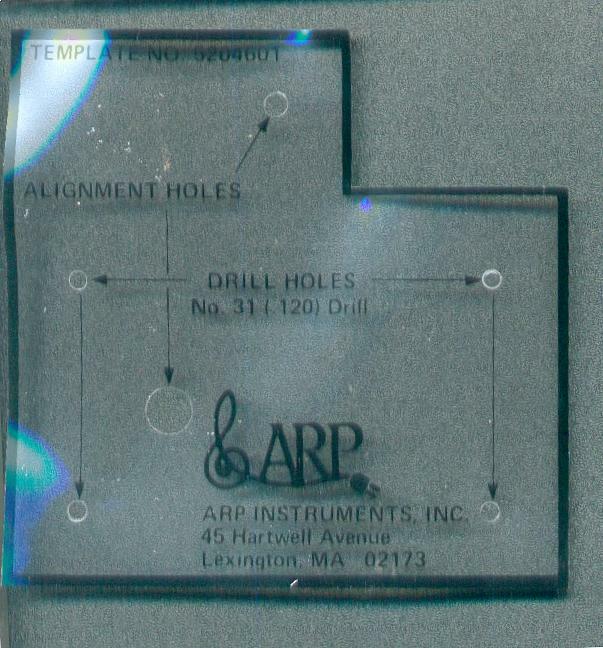 Defective noise transistors can be replaced with this modification. 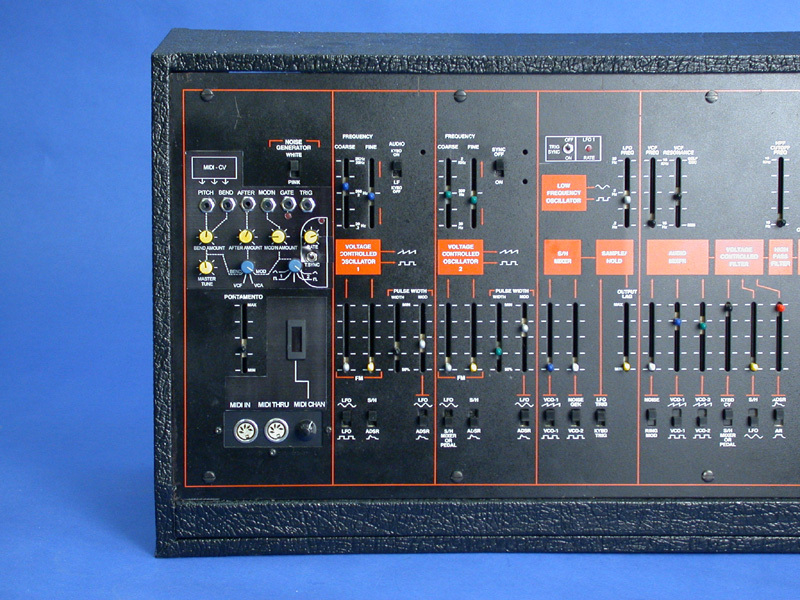 An ARP Odyssey MKI realized in bare metal, this ARP was fully restored and modified by Kevin "Synthfool" Lightner. It is extremely stable, reliable, sounds great and feels wonderful. It can make many sounds that no stock Ody can touch. 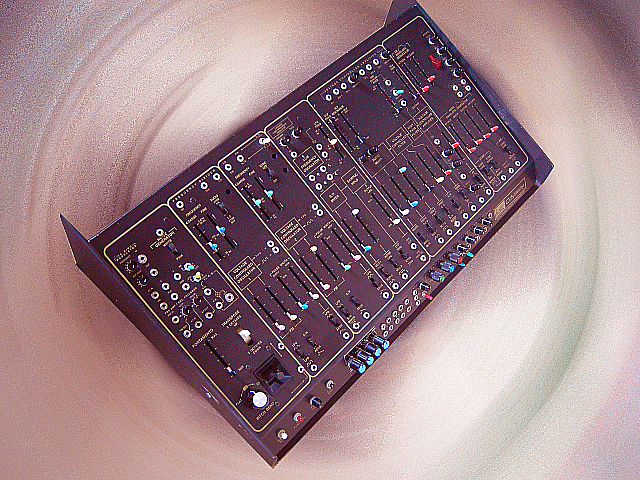 Accurate and reliable, but made for the adventurous synthesist. 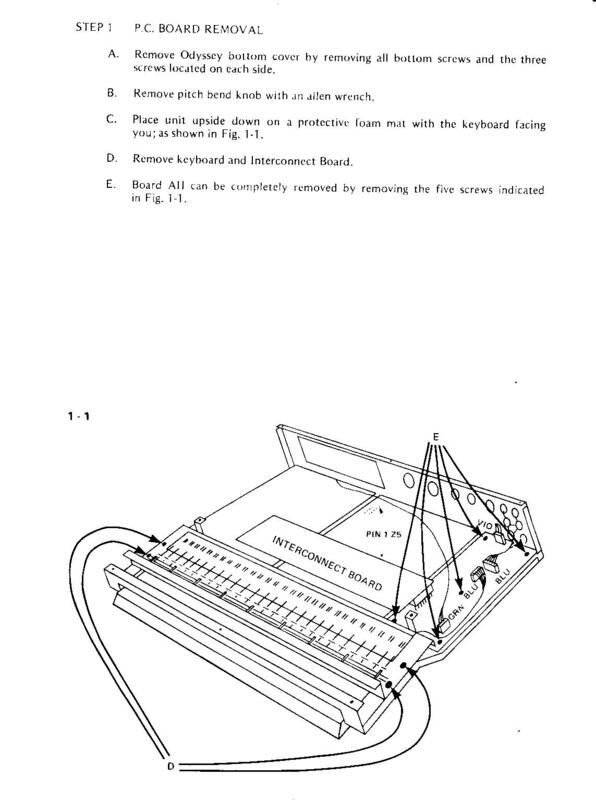 There are NO panel markings whatsoever. The case of this Ody was a whiteface. However, some of the insides and keyboard are from a later unit. All jacks and hardware are new Switchcraft. All of the later model CV, Gate and Trig jacks were added, so using a MIDI to CV converter is possible. Keyboard was completely restored. New bushings, hand polished buss bars, later 2 buss style using J wires. Fully adjusted keys and lubed action. As good as they get. More reliable than stock white Ody 3 buss models too. It has a 4 Mode CEM3320 Voltage controlled filter. 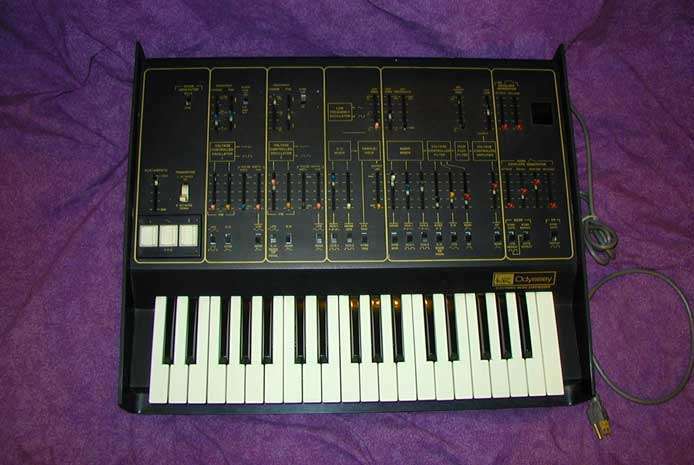 This is the same chip used in the Elka Synthex, PPG Wave 2.0, Rev 3 Prophet 5, Pro-One and the Oberheim OBXa & OB8. 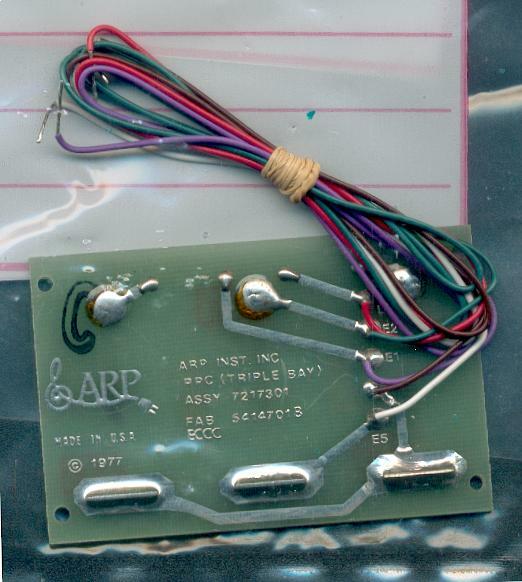 It's a -24dB/oct (4 pole) with switchable Low pass (LP), Band pass (BP), High pass (HP) and All pass (Phase shifter) outputs. A small added rotary switch near the filter chooses which response. 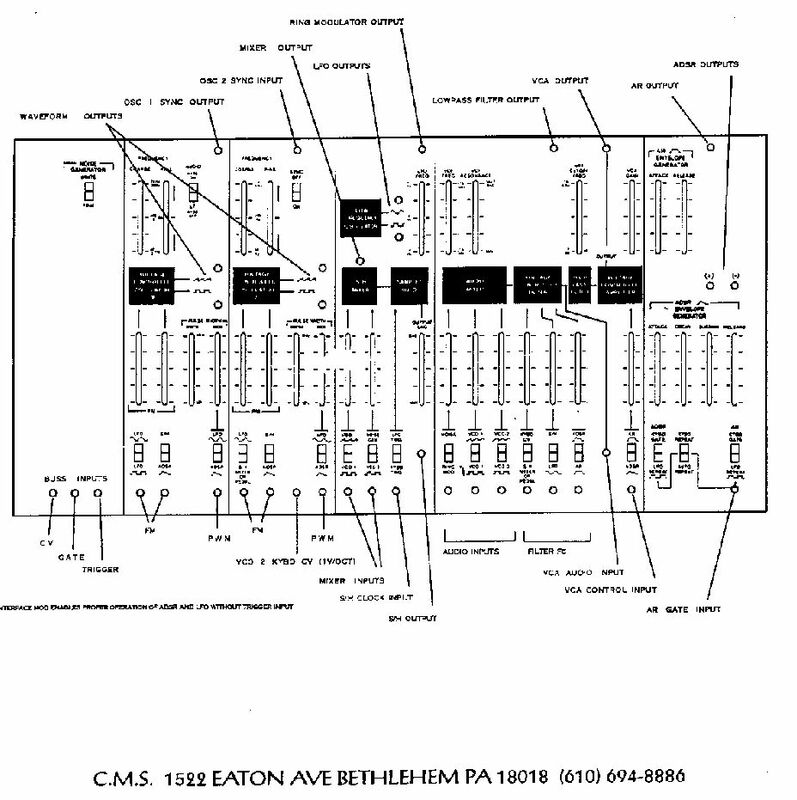 Can sound a lot like an Oberheim SEM in many ways. Lots of sizzle! Filter will self-resonate, no problem. External audio in works great. 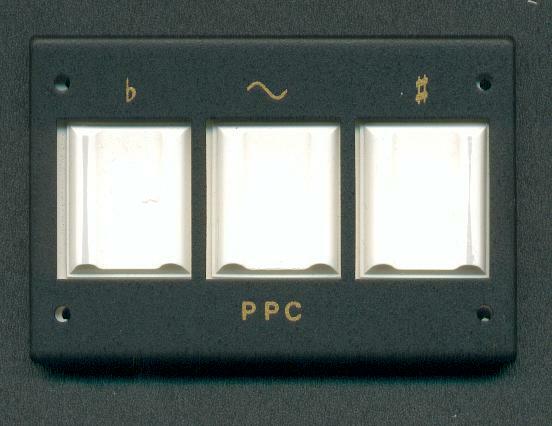 The HP slider has been changed to mix in the pre-filter, dry signal. 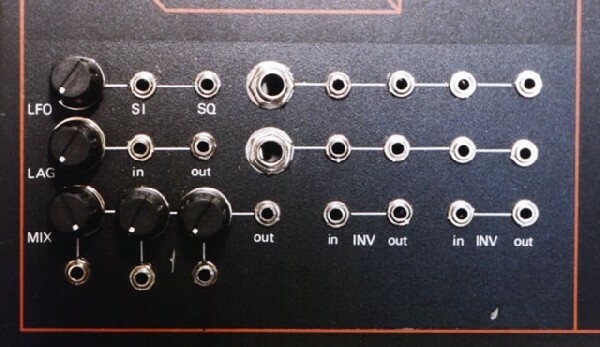 This allows cancellations with the VCF not possible on many synths and is certainly much better than that dumb stock Ody HP filter that few people use anyways. 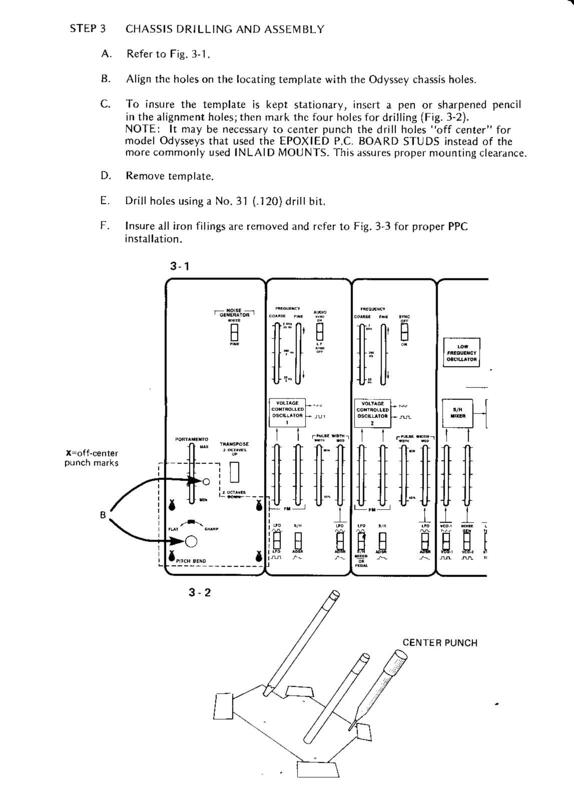 This is especially interesting when used with the phase shifter or high pass filter settings. LFO speeds were expanded. Can now go slower and faster than any stock Ody. 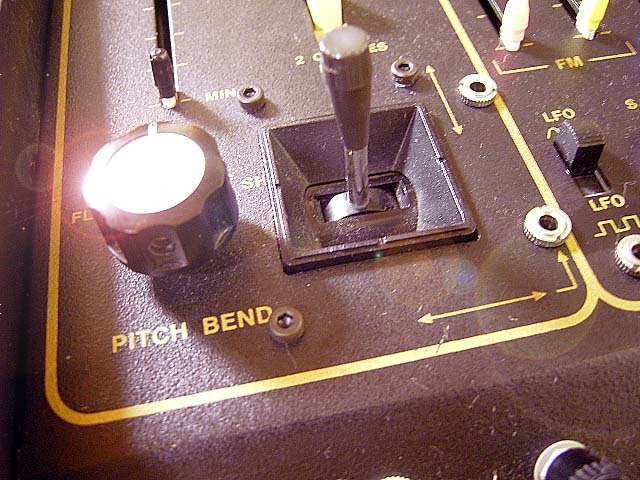 An added white LED above the slider indicates the rate. Since we have not disabled the keyboard retriggering of the LFO, the LED flashes much more brightly upon key presses. Sort of a dual function LED. The lag time for the sample and hold has been increased. This allows for slower changing random values. Perfect for trance music as the LFO can clock much slower too. All new exact replacement CTS adjustment trimmers. Most Odyssey's have 25+ year old calibration trimmers, so it's no wonder that many can't stay in tune or develop VCA popping and other problems. These new trimmers are much more stable and they stay put. Power supply was overhauled. New capacitors, new trimmers, new fuse and new power cord. Currently the unit is set for 120 VAC. Case has been stripped of paint, resurfaced and polished. Has some blemishes and grain here and there, but this adds to its raw appeal. We could have polished it even more and mirror surfaced it, but it'd end up blinding you under bright lights. 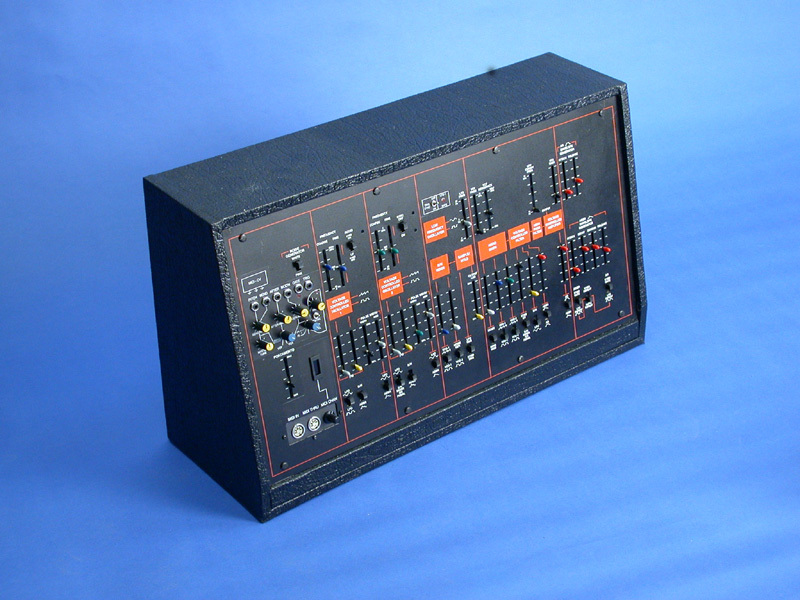 The VCO and keyboard interface boards are of a later Black and Gold Ody and more stable than white models from various design improvments. For example, Black Odys have less internal adjustments for tuning and so they keep their tuning more stable, especially over time. 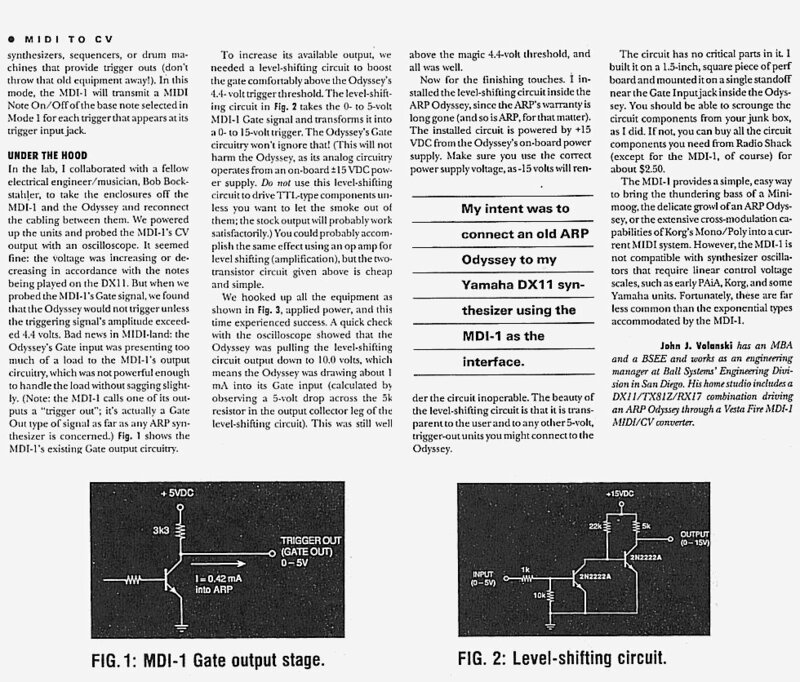 The filter board (with envs and vca) is from a white model. 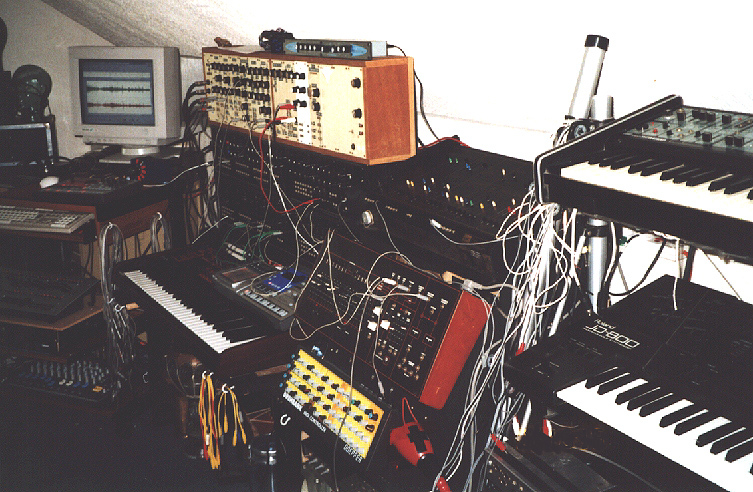 White Odys (at least stock ones) do *not* have Moog filters, as rumours persist. This filter is a 4 pole, multimode type and will run circles around a stock white Ody filter in terms of low end and versatility. It has three additional filter responses and offers many more variances by mixing in the raw, dry signal. Every slider was disassembled, specially cleaned, inspected, adjusted, polished, lubed and reassembled. That's 238 separate parts involved in about 20 different processes. All sliders feel verrry smooooth. 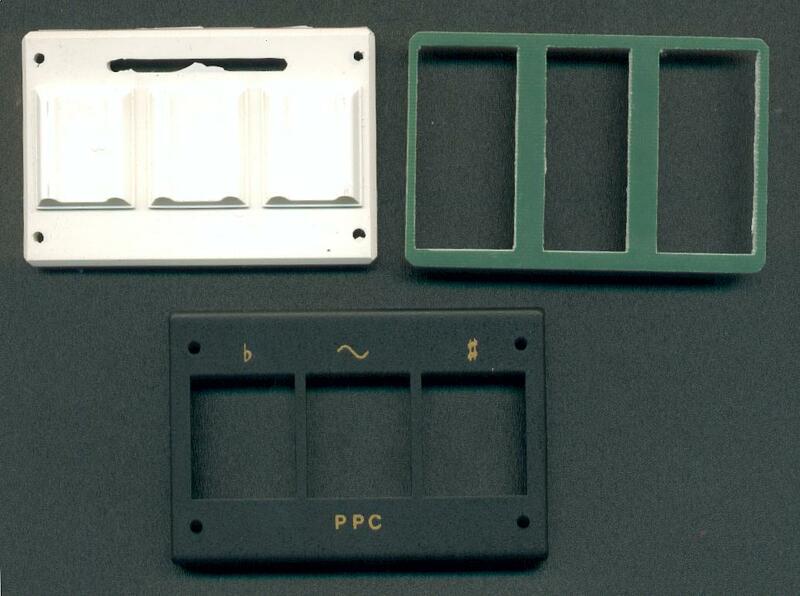 The power switch is much more reliable than the stock one and has double gold contacts. The "low" audio out has been converted to high level. It has new rubber feet. Almost all screws used are stainless steel, inside and out! Thanks to Andy for contributing these original retrofit kit images and photos! Thanks to Paul for sending these to me from the UK! 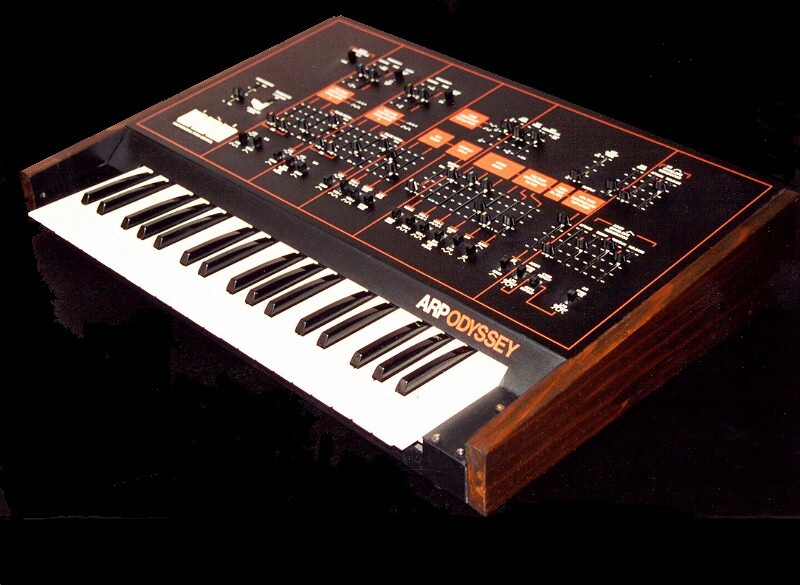 The history of this "M-Ody", as it has been dubbed, is as follows: I purchased it via E-bay from a guy in Brighton who was selling it to help finance buying a 2600. He had purchased it from renowned author/ musician Gordon Reid (www.gordonreid.co.uk) as a source of spares. The panel had already been separated from the case and keyboard assembly and arrived in "original", i.e., complete but scruffy, condition. 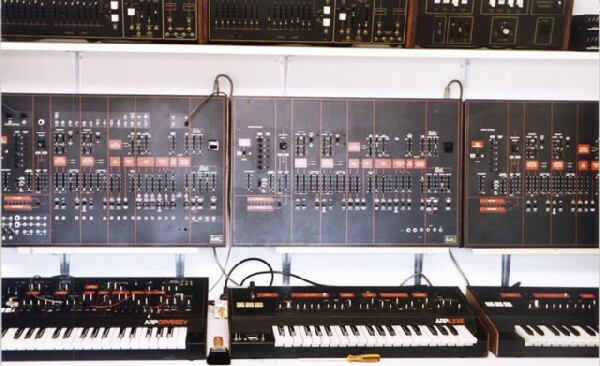 Like so many of us I have a long standing obsession with analogue synths dating back 30 years or more and despite owning lots of classics (Minimoog, Prophet 5, Polymoog, Pro-Soloist, etc.) I had never had an Ody. I started to refurbish this one, which dates from 1979 I think, with modern Op-amps, multi-turn pots for the V/Oct trimmers and as much pot cleaning fluid as I could find! Whilst doing this I had a visit from a mate who drooled over the idea of having the Ody as a MIDI expander and so I built the machine to his spec as you see it. 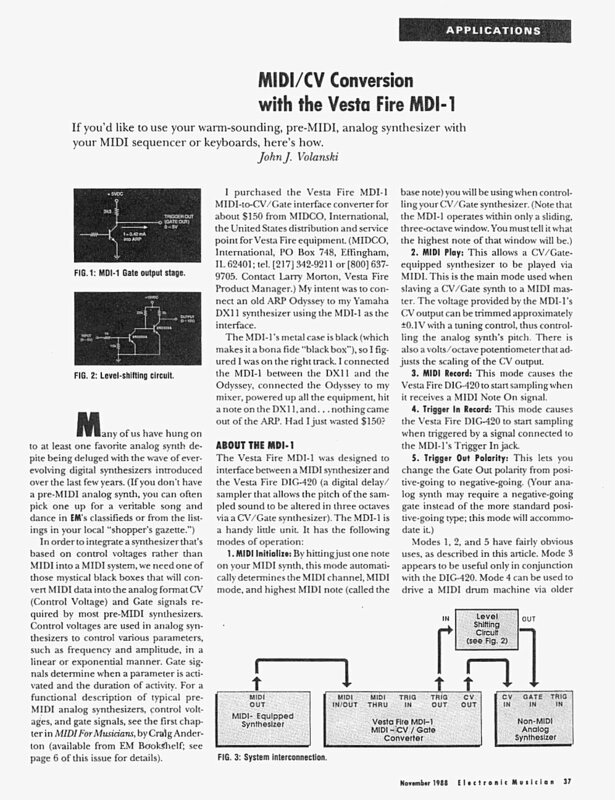 One curious aspect of the MIDI implementation is that he didn't want to use the velocity CV to control anything - crazy I think, but it's available in there for anyone who wants to do stuff with it. Sod's Law meant that within a couple of months my mate went on to find a 2600 for a bargain price, which I have subsequently refurbished for him, and decided that the Ody wasn't needed!! He and I are sharing proceeds from the sale in some convoluted and inextricable deal. I did think about having the Ody back for myself but we decided to e-bay it. We've both had some fun with it as a project and hopefully someone will love it in the future. 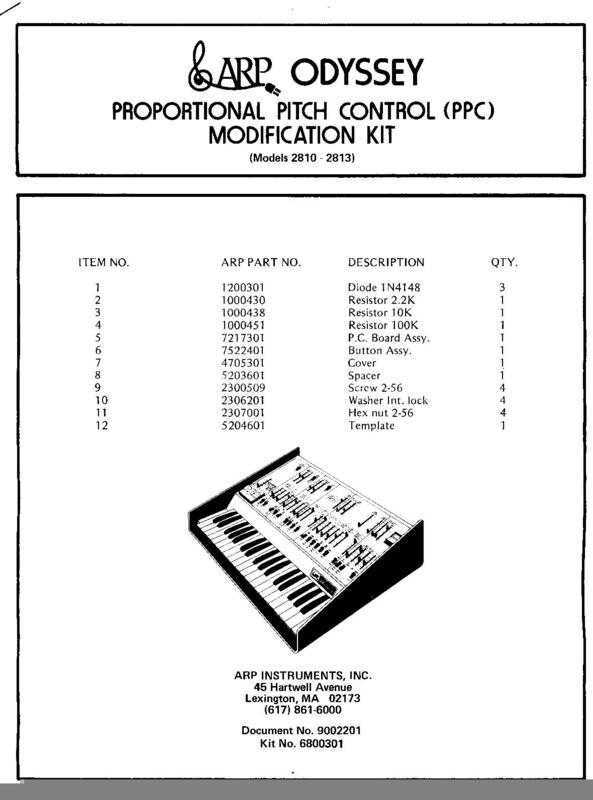 Allows you to control the VCF Cutoff Freq with MIDI. Cooool! When I finally have some time left I'll do the other 2 Avatars, the 2 Axxes and the Odyssey. The Odyssey has some old mods that I did 15 years ago. Here's a photo of my newly modified and refurbished red Odyssey. I desoldered all of the sliders and cleaned them all. I then reassembled and relubricated them. 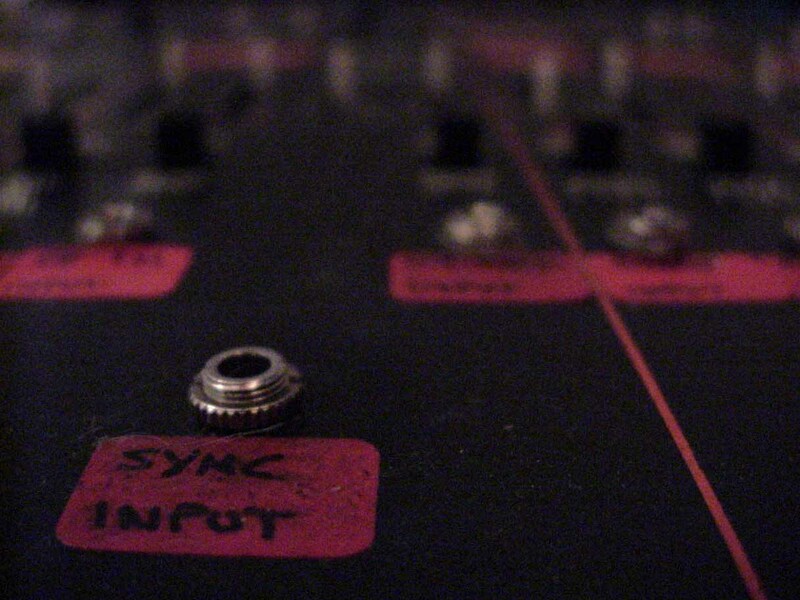 I have also attached switching jacks to all of the patch points in the synth. 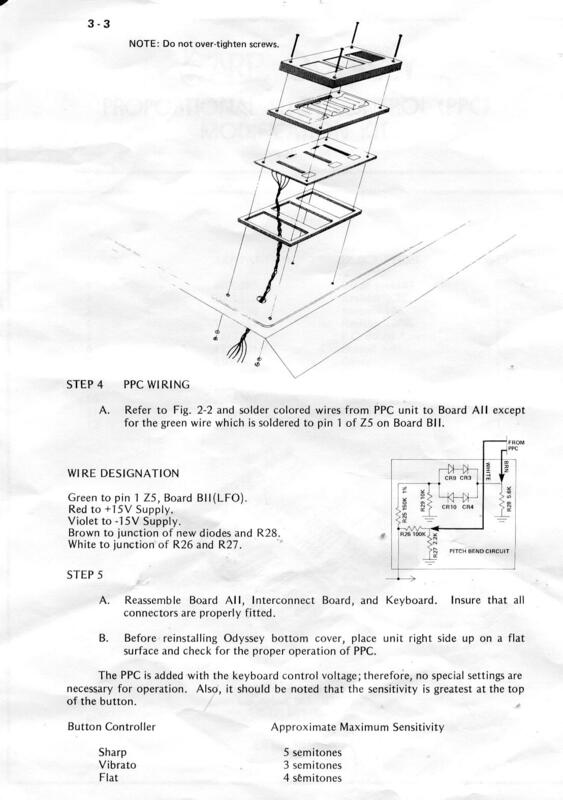 When an 1/8th inch jack is plugged in to one of the points, the signal chain is broken at that point. 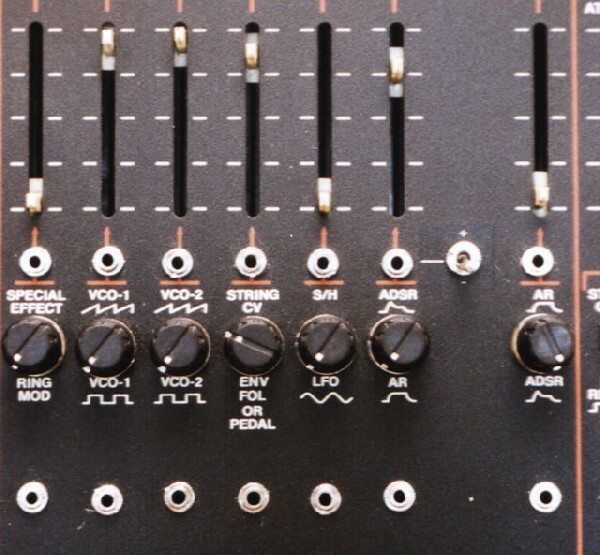 For the frequency control on the VCOs and VCF, the switching jacks run directly into the slider above them, allowing for attenuation of any signal. 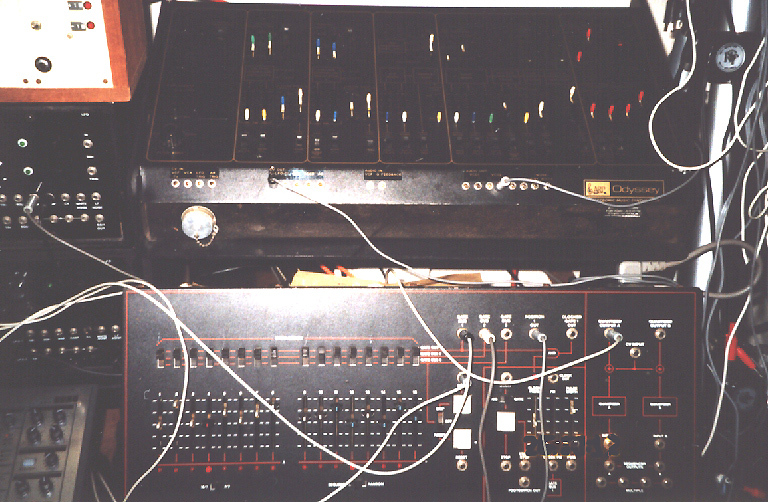 4 knobs were added below the vcf mixer, allowing for control of up to 4 additional audio input signals. I also added a blue LED to monitor the lfo rate and it is attached to the square wave output. 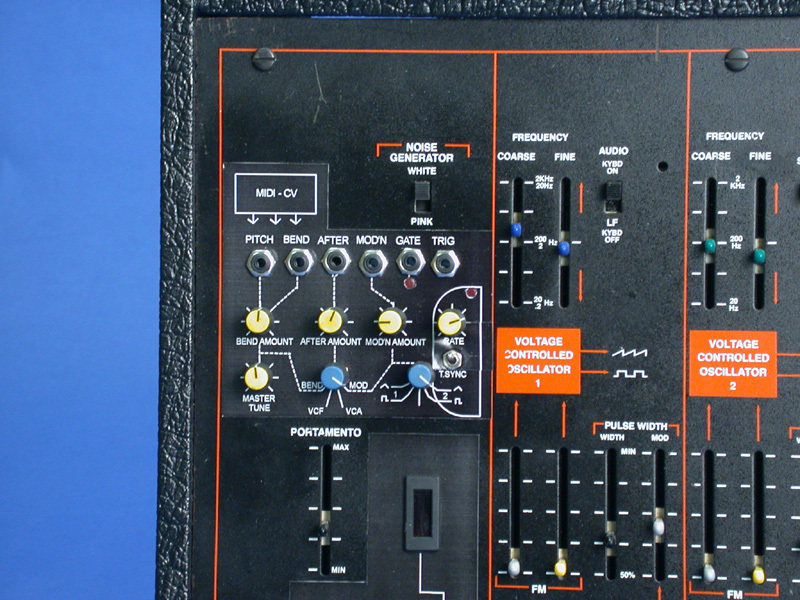 On the rear of the synth are jacks for CV in and out, Gate in and out and Trig in and out, allowing for midi control. 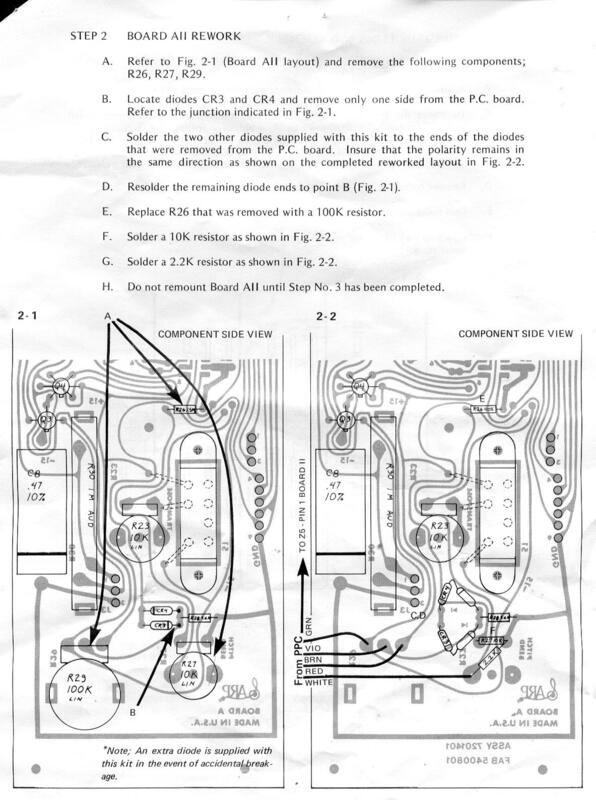 There is a switching jack on VCO 2 allowing for individial 1v/oct CV to separately control that oscillator. 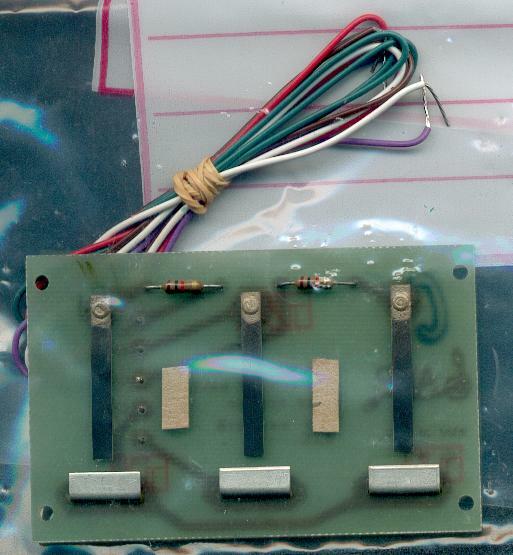 The synth was completely removed from it's case and the finish was stripped and sanded until it was bare metal. I applied a coat of primer, taped up the parts that I wanted black and applied a few coats of high gloss red spraypaint. Once dried, I applied black textured spray paint to the appropriate sections. 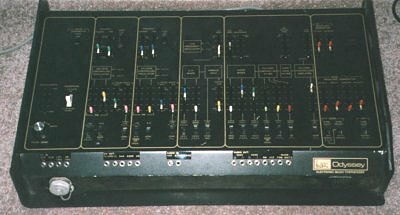 Once reassembled, I was delighted to find that the sliders moved smoothly and there were no more scratchy/intermittent pots on the unit. 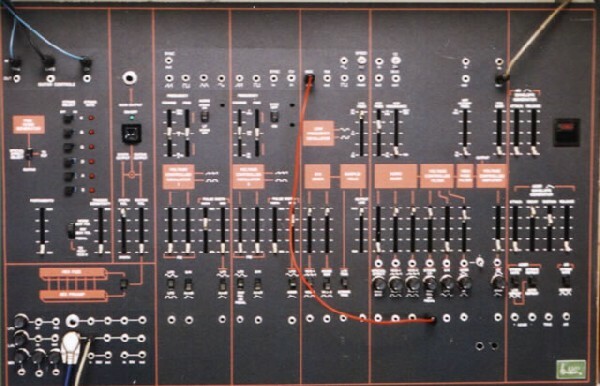 Now I can interface the ARP with my modular and make complex sounds with my odyssey that I never thought that it would be capable of. 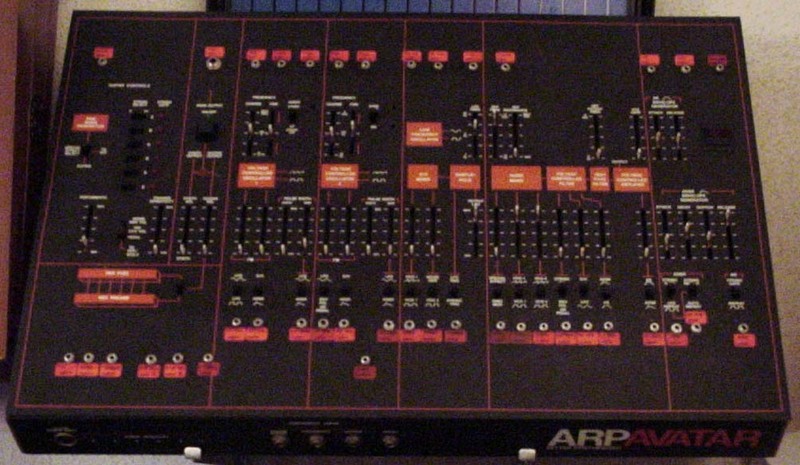 These photographs are of a keyboardless ARP Odyssey called B2K that I remodeled. It is owned by Sam Lee Uff. He is a very famous musician in Japan. The name B2K originates because it looks like BATMANs CAR. Comments, suggestions and additions may be emailed here.